Once again the independent Swiss watch brand Bovet 1822 brings us one of the most spectacular watches of the year in the all-new Recital 22 Grand Recital watch. Several years in the making the nearly half-a-million-dollar watch holds five patents. 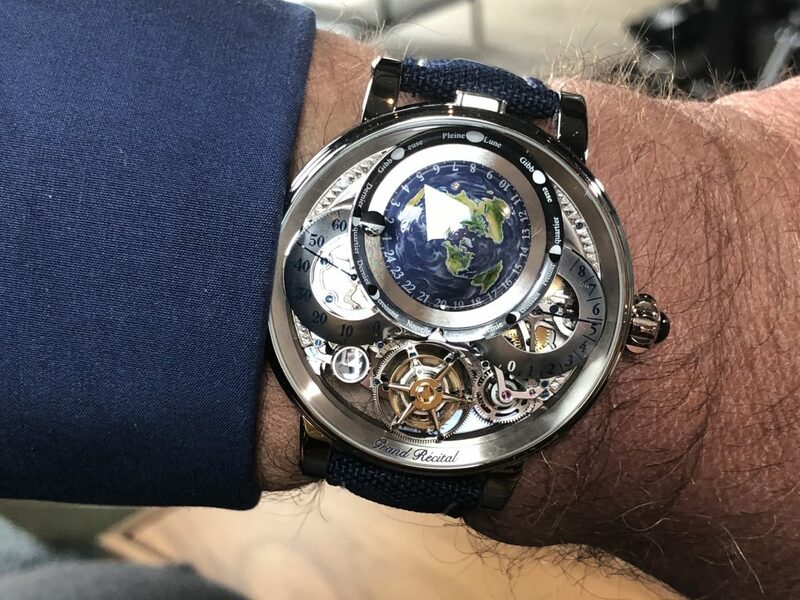 An exemplary masterpiece of innovation and craftsmanship, the watch displays the sun, moon and Earth in a Tellurium Orrery – a mechanical rendition of astronomical motions on the wrist. An Orrery is essentially a working planetarium that shows planetary orbits and their relative rotations or revolutions. The Tellurium Orrery only displays the Earth, the Moon and the Sun (while a Lunarium Orrery only includes the Earth and the Moon). 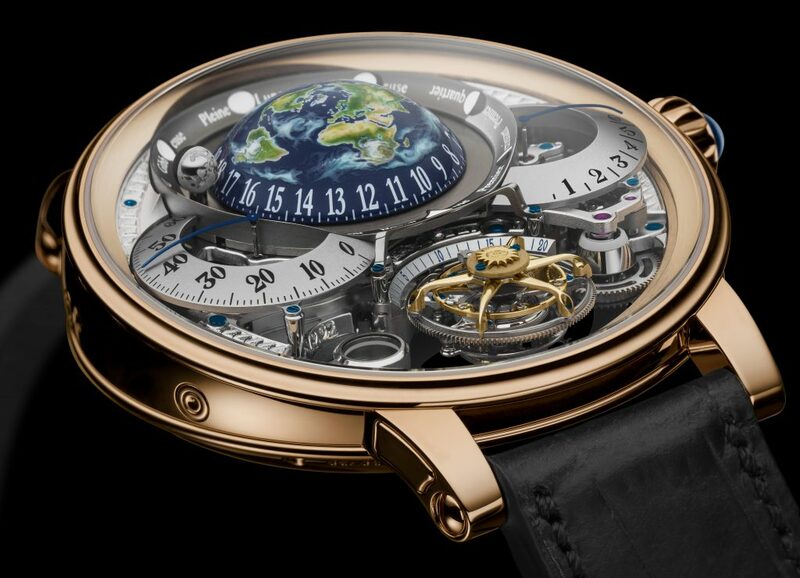 In this timepiece, Bovet 1822’s founder and owner, Pascal Raffy, envisions a blend of perfect form, essential functions and visionary techniques, fine decorative arts and impeccable classical craftsmanship. Working with his team, they have brought Raffy’s concepts to reality — offering a truly unique expression of time and space for the discerning collector. 9-day Flying Tourbillon Tellurium-Orrery and Retrograde Perpetual Calendar is offered in 18-karat 5N rose gold or in platinum. As a Tellurium, the watch displays three essential heavenly bodies – represented in different ways. 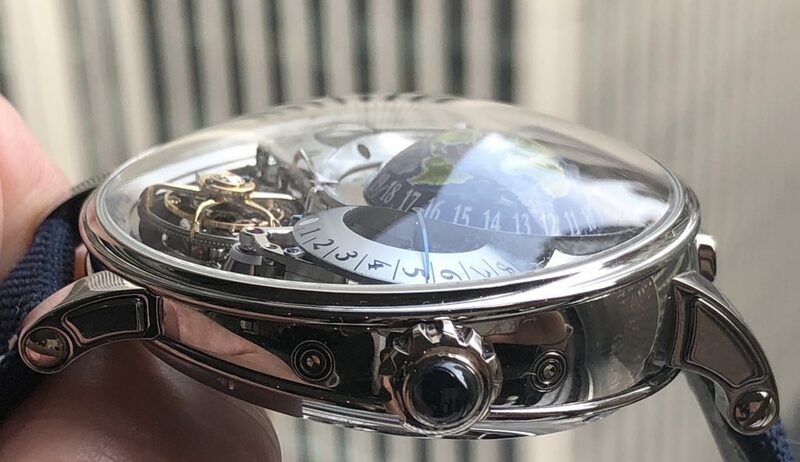 The flying tourbillon cage represents the sun at 6:00 that is raised above the rest of the movement, the earth globe rotates on its own axis and displays the hours on a 24-hour cycle, and the moon sphere orbits the Earth in its exact synodic period of 29.53 days. The patented construction of the double-sided tourbillon with center attachment makes the watch chronometrically advanced, and as it rotates once every 60 seconds, it also indicates the seconds thanks to a hand affixed to the carriage wheel. 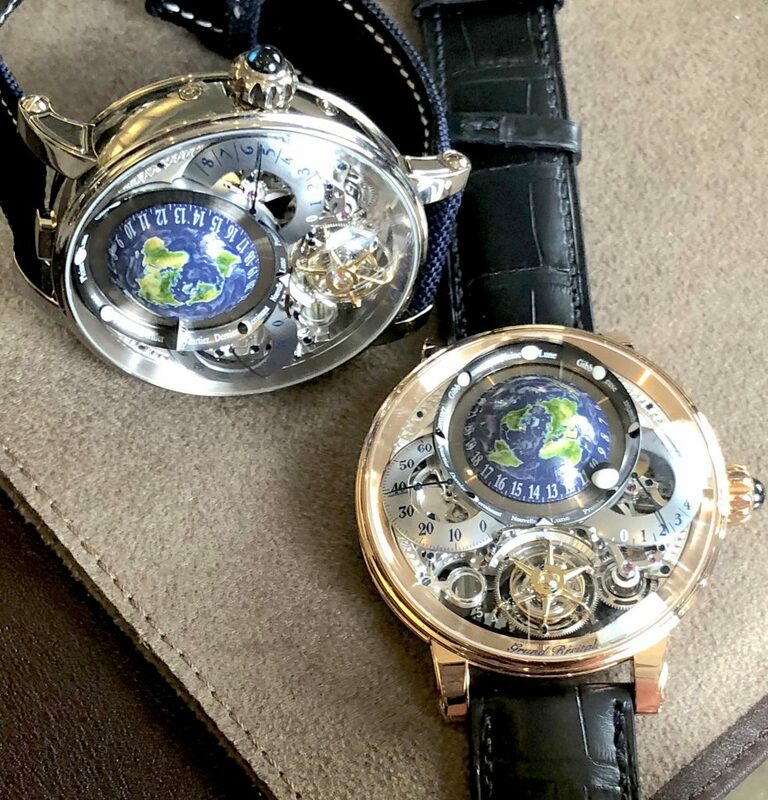 9-day Flying Tourbillon Tellurium-Orrery and Retrograde Perpetual Calendar features a hand-engraved and hand-painted Earth globe. 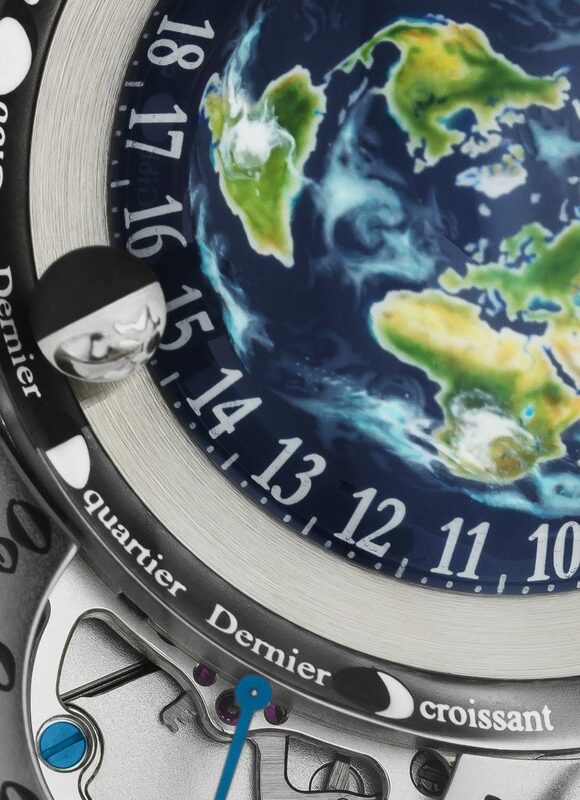 While the “sun” is incredibly alluring thanks to the mesmerizing movement and craftsmanship, the Earth is equally as intriguing thanks to the engraved and hand-painted map that shows oceans, forests, mountains and deserts on the hemisphere globe. The hand painting done on this map uses a specially developed technique created by Bovet wherein the artist intermixes luminescence so that the miniature painting has a radiant appeal in the dark. Additionally, as the layers of lacquer over the engraving were added, the artisan also inserted tiny wisps of air and clouds that, as layers of lacquer were added, took on the appearance of floating above the Earth. Thanks to black/white color system of a ring that surrounds the Earth globe, one can tell where in the world it is night or day. The Earth indicates the hours via a polished titanium hand at that points to an hour scale the base of the globe. 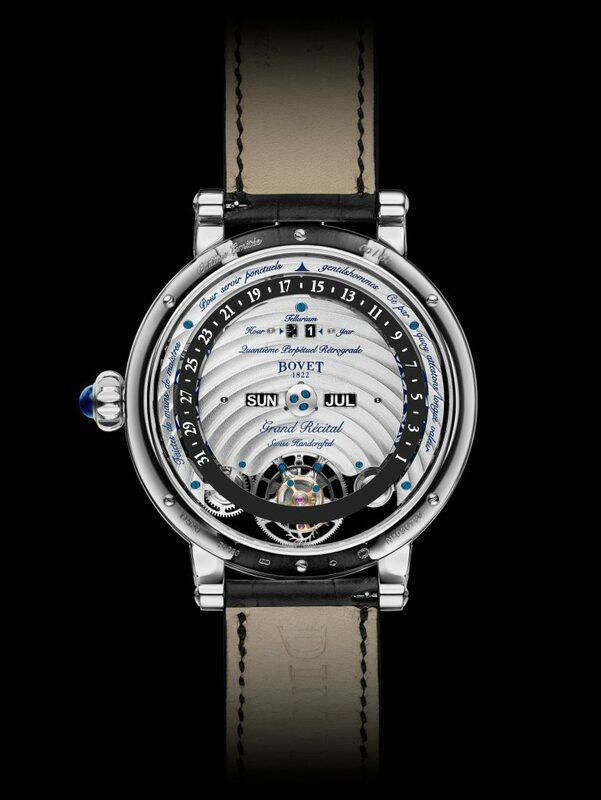 The moon orb (half black, half white) of the Bovet Recital 22 Grand Recital watch rotates around the Earth in real time. Finally, the moon orb that rotates once every 29.53 days around the Earth features a moonphase display that is also visible on the Earth’s concentric ring. The moonphase is accurate for 122 years, when it will need a one-day adjustment. The sphere is divided into a black portion with the surface of the moon painted on it, and white portion is engraved with a luminescent material to indicate the part of the moon illuminated by the sun. This combination of indications also holds a patent. While the seconds are shown on the tourbillon escapement and the hours are indicated (in 24-hour format) via the hand beneath the Earth, the minutes are displayed in a retrograde format on a circular subdial ring to the left beneath the Earth. Opposite that ring, to the right beneath the Earth, another subdial chapter ring offers a retrograde power reserve indication of nine days. In the center of each of these chapter rings is a sapphire magnifier glass that helps one focus on the mechanics beneath. The three-dimensional aspect of the Bovet Recital 22 Grand Recital watch is beautifully visible via the sapphire crystals. To the left of the tourbillon cage is a small round aperture with magnifying glass through which one can read the date beneath it. Additionally there are a host of other apertures through which one can read the day, month and leap year, as well as see the meticulously finished components with Cotes de Genève engravings and more. Wait, did you miss that? 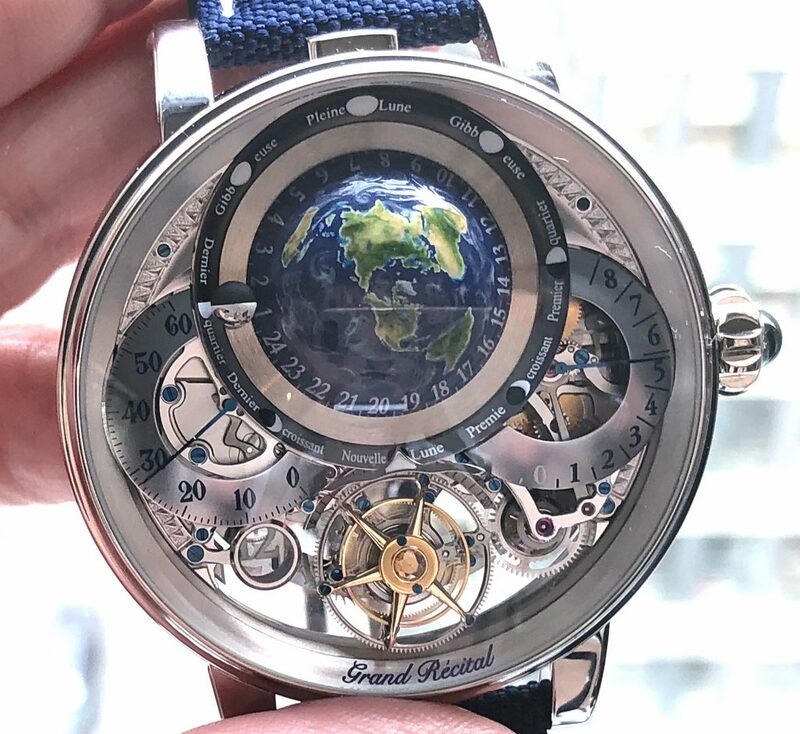 Yes, in addition to this watch being a Tellurium Orrery, the Bovet Recital 22 Grand Recital is also a perpetual calendar timepiece that includes a patented double-sided date disk. That date disk is driven by a retrograde mechanism that has a patented micrometric rack to reduce the need for space but also to optimize operation. The patented mechanism that operates the perpetual calendar has been simplified and uses traditional correctors for adjustments but also features a specially developed push piece on the upper lugs that adjusts all of the watch’s functions. A singe push of the push piece, for instance, simultaneously adjusts the perpetual calendar and the tellurium functions by a single day. The Bovet Recital 22 Grand Recital watch offers a perpetual calendar functions on the reverse side. Needless to say this watch has an incredibly complex movement that consists of 472 components and works with a single barrel that offers more than nine days of power reserve. The variable inertia balance and in-house-made balance spring ensures accuracy of the movement and oscillates at 18,000 vibrations per hour. 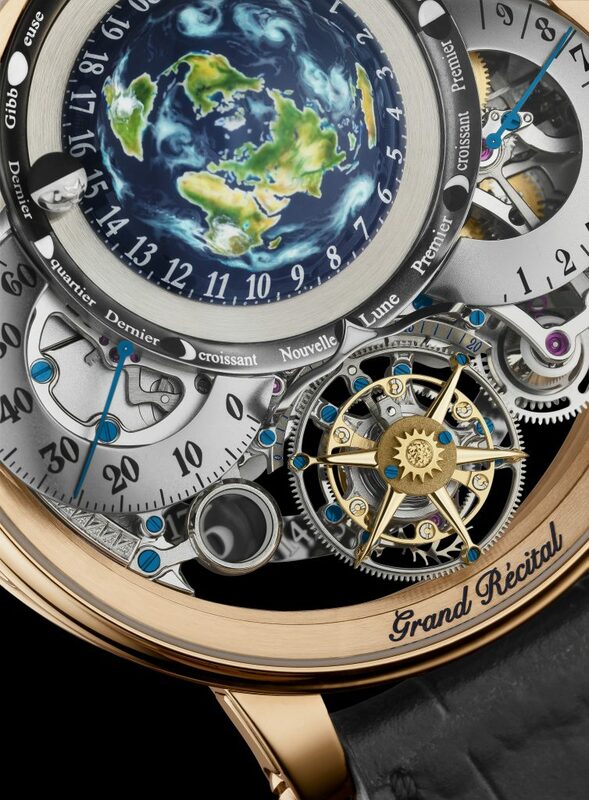 9-day Flying Tourbillon Tellurium-Orrery and Retrograde Perpetual Calendar retails in rose gold for $469,800. It doesn’t end there. The case design is inspired by a vintage writing box that features a distinct angle (typically used on desks to help one write at a perfect angle for mastering penmanship). Pascal Raffy was inspired to create this case shape because the writing box reminds him of his grandfather, who would tell him to always use one when penning letters and papers. Additionally, this architecture style for the 46mm case offers an inviting view inside the three-dimensional work of art. Just 60 pieces will ever be made, in cases of either 18-karat 5N rose gold or in platinum. Each is unique piece thanks to the individual hand engraving and painting that goes into each spherical globe. Additionally, though, the owners of each of the 60 pieces can order the exact orientation of the painted world map – choosing the location that will be positioned on the Earth-Sun axis in midday. Because of this ability to select the location, each watch is built only after the collector gives his special request. The 18-karat gold version of this watch retails for $469,800. 9-day Flying Tourbillon Tellurium-Orrery and Retrograde Perpetual Calendar is shaped like a writing box. The Recital 22 is the third in a trilogy of celestial watches that started in 2016 with the Recital 18 Shooting Star Tourbillon with patented asymmetrical case, and then moved on in 2017 to the Recital 20 Asterium Tourbillon with a host of incredible astronomical indications built in. Functions: Hours (24hr), Retrograde minutes, Seconds on the double-sided flying tourbillon, Precision Moon phase, Retrograde double-sided date, Power reserve. / Retrograde perpetual calendar on the back. PATENTS: Double-sided flying tourbillon. / Micrometric track for retrograde display. / Timepiece movement comprising a display mechanism for information relating to the movement of the moon. / Timepiece movement comprising a control organ which activates several mechanisms simultaneously. / Timepiece movement comprising an indicator visible on both sides of the movement simultaneously. May 3, 2018 in Brands, Educational info, Features, News, News, Off the Cuff/ watch reviews, Reviews and Articles, Time Capsules: Product, Timepieces News, Reviews and Articles, Watch Education.